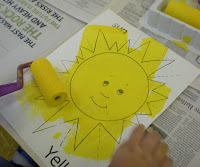 Our painting project was to roller paint a sun yellow for our color book. 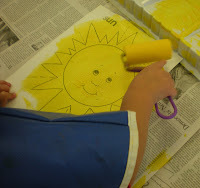 This was my first ever experience roller painting, (I know there is probably lots of gasping going on right now). Anyway the children did GREAT. I think they were more efficient roller painting than they were brush painting. I had envisioned paint splashed everywhere and oozing over the sides of the containers, but, no. They had a good time. 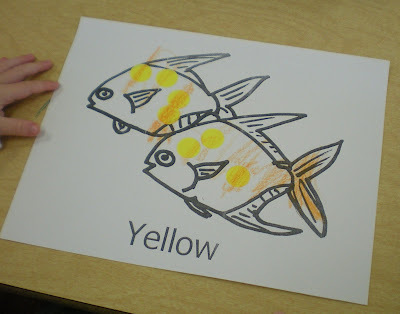 The next color page was a tropical fish page. 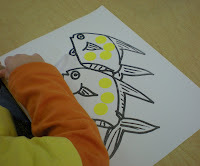 I again had the children put yellow dots on the fish and then color. I still had some that were not sure of that coloring thing. We'll keep trying. 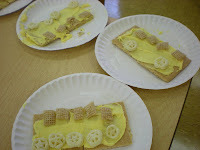 Our final yellow project was our yellow buses. We made these last year for the first time and they were a big hit. The spreading of the frosting was the hardest part. 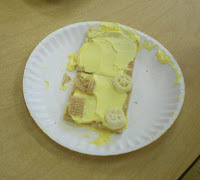 Just an FYI, we used Honeycomb cereal for the wheels, Rice Chex for the windows, Graham Crackers for the bus, and frosting to make it yellow. I have a peanut allergy in the class so I checked with Mom and all of these ingredients were good for him to have. 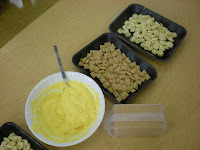 Next week we will mix the red and the yellow--oh what fun! I love this site. I am opening a Family Day Care, this is a great site! The bus is so cute and such a great idea! 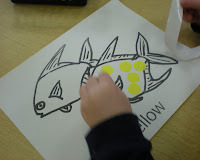 How fun to have a yellow week! I love it! 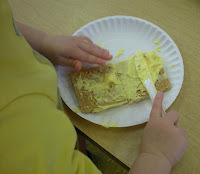 Yummy Yellow-y fun! 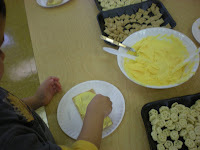 I made the buses with my class but used bananas for the wheels. Great idea to use chex for windows! :) Thanks for such an great blog! What brilliant fun!!!!!! 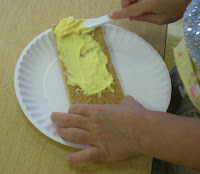 How did you make the frosting yellow? Food coloring? Or do you use the pre-made frosting? I adore the buses... really neat idea. You have awesome ideas. Keep writing.